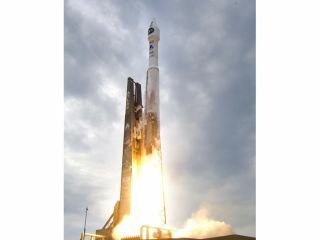 Nasa successfully launched an unmanned space rocket to the moon yesterday, some 10 years since the space agency's last lunar mission. The Lunar Reconnaissance Orbiter took off atop an Atlas V rocket from Florida's Kennedy Space Centre at 5.32pm US time and is set to take four days to reach its intended destination – some 226,000 miles away. The mission is set to go where only Pink Floyd have dared to go, the dark side of the moon. Here the LRO will try and search for water around the Moon's South Pole and take photographs of the surface which has so far not been seen by scientists back on Earth. The whole exercise, which was originally planned for October but a number of setbacks have delayed the launch, is to lay the groundwork for a manned mission to the Moon in 2012. About the latest launch, Craig Tooley, Nasa's LRO project manager said: "We have better maps of Mars than we do of our own Moon. "This is an amazingly sophisticated spacecraft. Its suite of instruments will send us data in areas where we've been hungry for information for years."